Fort Wayne, IN (June 12, 2018) VRI — Flags representing the branches of the United States Military were restored to their places outside Fort Wayne's VA Hospital Tuesday afternoon -- but not until after someone swiped the LGBT "pride" flag that had gone up in their place. 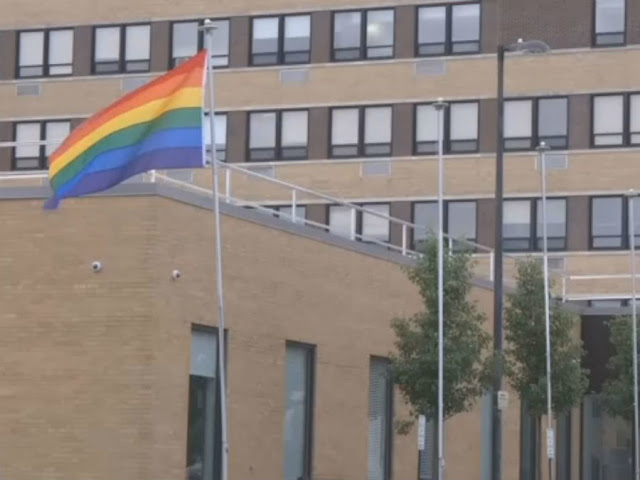 Some residents and veterans expressed their outrage after they arrived at the hospital Tuesday morning and noticed the military flags had all been removed. On one post, instead, a rainbow pride flag flew, in honor of LGBT pride month. Public Affairs Officer responded to the situation with a statement saying they are flying the flag to honor LGBT veterans. He said due to the limited number of poles outside the VA facility, the Service Flags were temporarily lowered. He said rather than take only one flag down, they decided to lower all of the flags. Officials intended to return the branch flags to their usual spots, but that happened sooner than anticipated because somebody lowered, then drove off with, the pride flag early in the afternoon. "We are aware of concerns voiced by some of our employees and Veterans about the Service Flags removed outside of the Fort Wayne campus. As we are committed to serving all Veterans and June is LGBT awareness month, we are flying the flag that represents and honors these Veterans as a display of solidarity and respect for their service. We all serve this nation. Due to limitations in the number of flag poles outside our VA, the Service Flags were lowered temporarily. Rather than take one flag down temporarily, it was determined to lower all the flags so as to be equal. The one flag will fly for the day until 5 p.m. and signify that we treat all our Veterans equally. We greatly appreciate our Veterans' and employees' passion and loyalty for their individual services. Today, we honor our LGBT Veterans and their service."